In 2010, we carried on exploring former Yugoslavia going to Slovenia, small colorful country marked by its natural treasures. The diversity of landscapes is amazing compared to the small size. From the Julian Alps to the small Adriatic coast with Venetian accents, through the inland medieval villages and the amazing north-eastern vineyards, it never stops surprising and enchanting us. As far as catering is concerned, it’s the country where we ate the best. Like Bulgaria, it is a little-known country which deserves to be known. However, the reasons are different. Indeed, it is near and easily accessible for most European countries; it's even said that this is where whole Europe meets. But actually, it suffers from the competition imposed by countries around (Italy, Croatia and Austria) with a long asserted tourist identity. However, it must be more than a crossroads or a stopover because it has many treasures to reveal. 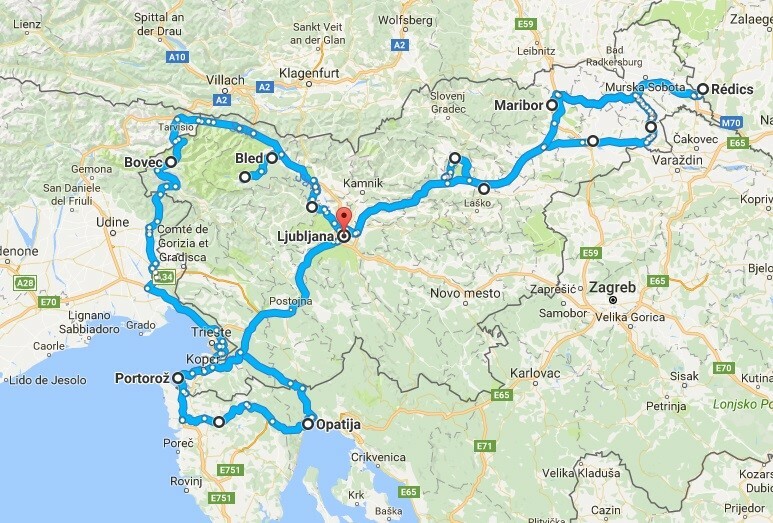 We went back there for one day and one night in June 2012 during our auto-tour in Austria, and then for longer in August 2014 during a combined trip to these two countries, every time with a lot of happiness. We shared our love for Slovenia with a couple of friends who came with us in October 2016, and who was also seduced. We could admire landscapes that blossomed into glowing colors of the fall, and we had the feeling of rediscovering it. We even had the luxury of a one day trip to Venice, which is not so far. We feel permanently attached to this country, especially its capital Ljubljana, where we had more time to linger during our last stay. We discovered a lot about it again and we want to carry on going back there regularly. We know it and enjoy it more every time. It is permanently familiar to us. Many of its nooks and crannies appeal to us and sometimes it feels like home to us. 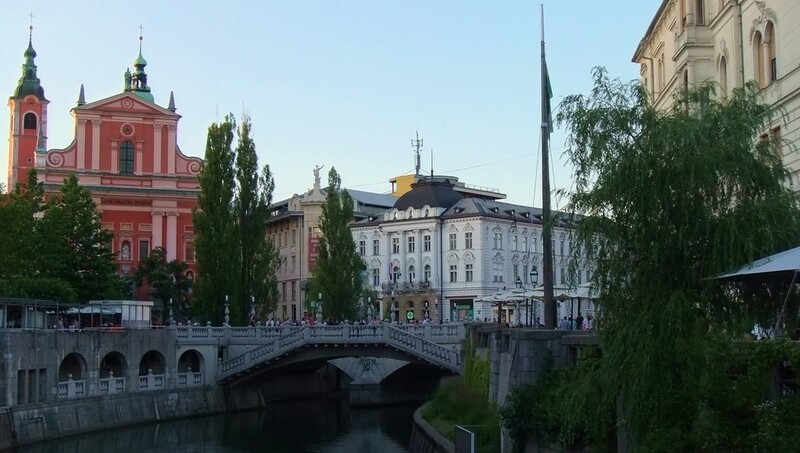 You live Ljubljana, «the beloved», more than you visit it. It became our favorite city, though Prague is the most beautiful we have ever visited. It does not necessarily get hold of you from the first moment. You must allow it the time to seduce you. It is not flashy, but it reveals its charms slowly at the bend of a bridge, a typical street or the banks of the Ljubljanica. It is a small capital with a provincial appearance, yet including countless churches and museums. The historic center, not very extensive, flourishes in a soothing architecture. Contrasts and colors fit perfectly. Baroque is the predominant style, but Art Nouveau and Neo-Renaissance style buildings have their place as well. Armfuls of fresh and colorful flowers hang casually along the Ljubljanica quays and the bridges overlooking it, including the famous Triple Bridge with a Venetian character. The atmosphere is young, warm and lively. The daily market brings cheerfulness to the old center and draws some musicians who come to perform. The Castle set high up offers a view from above over the city. It is located in both green and shaded surroundings. It is rather pleasant to visit. However, the presence inside of metal protective structures, including cable railings, can be regrettable. The choice of materials going better with stone, such as wood, would have been more appropriate. To join it, two options are available to you: the funicular, or climb on foot for the bravest. At night, Ljubljana is both very romantic and very carefree. The lighting shows off the main buildings to advantage. Flames from the torches sometimes hanging at regular intervals along the banks of the Ljubljanica - lined with countless cafés and restaurants - give the place an undeniable charm, simply magical. Lanterns and candles on tables and pedestal tables come to complete this soft luminosity, so does the subdued lighting of street lamps. Street performances are diverse, but the one which appealed to us especially was the musician on glasses who played famous symphonies, which lent themselves perfectly to the fairy night atmosphere of the city. Walking away from the city center along the Ljubljanica in the direction of Trnovo and Rudnik areas, you will notice that the river follows a curve on the left to face the Botanical Garden. It is one of the favorite places of local young people who like to meet there at night. The atmosphere on the banks is pleasant and relaxed. One evening in June 2012, we saw with amusement one of them riding on water a funny machine he had made himself : a bike with a barrel welded to the fork that allowed him to float, and two rear-mounted barrels fitted with small paddles connected to the pedal and gear mechanism. It was the attraction of the evening. Finally, let's be honest: if according to you, vacation means an unbridled nightlife scouring trendy discos overnight, you will not be completely satisfied. In Ljubljana, people like partying in their own way. It is friendly, people are happy to live, pleasant and cheerful without being exuberant. Young or old, all love to laugh, to have fun very simply. Ljubljana is an indefinable atmosphere, a pleasant sweetness of life. It is more romantic than expansive. There, you feel good, you feel alive. Quite simply. You leave it feeling melancholic, because once you fell under its spell and finally adopted it, you leave a part of yourself there. Ljubljana is part of our favorite cities. To have direct access to the rubric, click here. 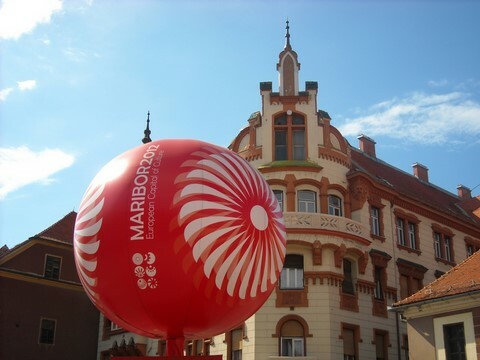 Maribor is the second largest city in the country, and the only university town with Ljubljana. The atmosphere is lively and young. As the capital, we only started to really appreciate it from the second visit, but it permanently appealed to us as well. We had the luck to find ourselves there in June 2012, year where it was European Capital of Culture, which we did not know. Many events were taking place then. Old fortress, it has a castle, ramparts and defensive towers. It stretches from both sides of the Drava River and the hills are covered with vineyards. However, the oldest vine in the world (over 400 years) is located in the city center, and it still produces grape and wine. The old town is superb. The University, the Slovenian Grand Theatre, the Provincial Museum, the Janez Krstnik Cathedral, the former Town Hall Rotovž are architectural treasures. Very diversified styles meet: Renaissance, Baroque, Rococo, Gothic, Venetian... The alleys lead to magnificent places where it is good to live. For lovers, the organic market takes place every Friday on the old square, Glavni Trg. Ptuj, historical town, is the oldest in the country. The heart of the city is made up of narrow streets that lead to the Drava River. It knew many cultures and civilizations, which gave it a much diversified architecture. The main buildings were restored in the 1980s. Its very extensive Castle houses the Provincial Museum. Its courtyard has beautiful arches, pillars and Tuscan columns. The Dominican Monastery, the Drava River Tower, the old market square, churches and mansions are also worth seeing. The vineyards of Jéruzalem lie on a hilly area. When you have a view from above, you are amazed by the breathtaking curves followed by the vines rows, which make you think with a bit of imagination of terrace rice fields in Bali and the Philippines, making due allowance, of course. We went there at the end of the day in the summer of 2010, and the sun was shining down on the hillsides with soft and shimmering colors, in a remarkably deep calm. The place was particularly entrancing. In 2016, we wanted to visit the Vinotheque of Jéruzalem, but it had unfortunately closed sooner than expected. Then we went to the Puklavec mansion to have a high quality wine tasting in an idyllic setting. Moreover, we had a warm welcome. The Žiče Carthusian Monastery is hard to find for the simple reason that it's not located in Žiče itself but in Žička Kartuzija, 7 or 8 kilometers west of Žiče. We didn't know it and that's why we were not able to find it in 2010 and 2014. But we found further information before our stay in October 2016, because we didn't want to give up and thus we decided the third attempt would be the right one. We didn't regret to insist, because it's a place out of the ordinary. The peace that emerges from it is entrancing, and that place gives us the impression that time has definitely stopped there. That monastery surrounded with ramparts was founded in 1160. It's rather well preserved, excepted the church which roof caved in. The only defensive tower that remained was restored. Embedded in its pleasant green setting, it's a real haven of peace that temps to meditation. The dense forest that surrounds it seems to isolate it from the rest of the world, which adds to its both intriguing and captivating charm. Ruins are close to renovated parts, but it doesn't alter in any way the harmony of the ensemble, which includes among others a Gothic chapel, a small museum and an herbalist's shop. The latter was rebuilt in order to take up again the ancestral tradition of healers and herbal therapy that earned that place its reputation. Celje is a town filled with history, but which has paradoxically a few interesting buildings to offer. Its only real attraction is its Old Castle. Majestically perched on its rocky promontory and slightly outlying, it seems to watch over the austere city. That’s why you are immediately tempted to turn your eyes away from the latter to take a intrigued and admiring look to that monument with a massive silhouette. It has all the characteristics of medieval fortified castles. Various festivities take place there all along the year, but the most interesting is the medieval fair accompanied with a particularly copious feast. In the same way, Velenje only has its castle as a major point of interest. It was built in the 13th century in Renaissance style, as evidenced by its towers and its courtyard with arches. It has undergone some renovations, but its overall appearance almost remained the same. It houses a museum, a boutique with an old-fashioned charm, and an inn from the 1930’s filled with authenticity. Finally, the town was partner with Maribor, European Capital of Culture in 2012. This border region with Austria and Italy is mostly occupied by the Julian Alps and the breathtaking Triglav National Park. It abounds in remarkable natural sites, and includes two medieval towns: Škofja Loka and Kranj. Škofja Loka, medieval city with harmonious shapes, is one of the most beautiful cities in Slovenia. Its old squares show their Renaissance façades, and its inner courtyards, often accessible, will enchant you with their vaults and their arches. We had the privilege and the wonder of attending a medieval market and various performances and processions with period costumes. It all matched perfectly with the magnificent setting of the charming city, leaving us with an indescribable impression of time travel. Kranj is an ancient fair city erected on a rocky promontory. The old town is very attractive, particularly the market square and its beautiful Gothic and Renaissance style houses. Although it suffers from its proximity to Ljubljana, the 4th city in Slovenia enjoys a dynamic atmosphere. Its beauty and diversity call for stroll. A pedestrian zone allows you to discover it quite serenely, with the Church Sv. Fabjan perched on the promontory as a peak. Near the theatre stands the statue of the poet Prešeren, who lived his last three years in Kranj. Bled is a must-see. The « Pearl of the Alps » is on its own a real attraction which draws crowd. The lake overhung by its castle, the famous island and its church embedded in blue water with the mountains tops in the background make it an unforgettable place. It is a real postcard landscape where many photographers - professional or amateur - linger for a long time. It has also hot springs. Even if it seems at hand from the lakeshore, the small island appears to be both mysterious and dreamlike. You can get to it with the « pletna », charming local gondola. The walk around the lake is a real delight. The Gorges of Vingtar are located east of the Bled Lake. The immaculate foam of the waterfalls flows into the pure and crystal-clear blue of the river which abounds in trout. The path which runs along it is punctuated with small wooden footbridges, which gives this place an additional charm. The thick greenery completes this gripping play of colors. After a good walking, it ends up in an amazing waterfall which force will astound you, with a deafening noise and a rising current of drizzle. You can admire it from a small wooden bridge that overhangs it. According to the configuration of the place, rays of sunshine came in very rarely. So, it is advisable to cover up well, preferably with waterproof clothes because you will be exposed to the water that sometimes streams down the rocks above you, and to the splashes of the river and the waterfalls. Moreover, opt for hiking boots and beware wooden bridges which can be slippery when wet. Zelenci Nature Reserve stands near the Italian and Austrian borders, west of Kranjska Gora. It’s very rich in flora. Shady trails are beautiful and pleasant, arranged in places as wooden footbridges. They will lead you to a lake with a remarkable purity, where pontoons extend towards turquoise water. It is one of the sources of the Sava River. Many birds live there part of the year. A wooden observatory allows you to admire this particularly absorbing panorama. Not far away, the top of Jalovec, Nadiže waterfall and the Vršič Pass await you. However, don't go on an adventure if you are not experienced hikers, because the proposed routes include sometimes places with particular difficulties. Just admire them from a distance, it is already a lot. Bovec is a paradise for enthusiasts of rafting, canoeing, canyoning and skiing in winter. At night you can attend a summer tradition in small Slovenian villages’ cemeteries: the inhabitants come to honor the memory of the dead by placing candles and lanterns on the graves. Bovec cemetery is slightly sloping, overhung by the mausoleum and its steps. Without gate, it is accessible to everyone night and day. The sight is even more magical when an incredibly deep cloudless sky permits you to admire the stars as well. Warning: if you stay in a hotel, you will have to pay a tourist tax before you leave. 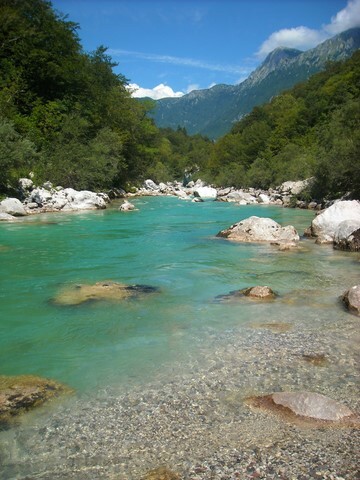 The Soča River is an incredibly turquoise river offering great currents. Paradise for fishermen, kayakers and bathers, it has its source in the Julian Alps. A few wooden suspension bridges with a typical charm overlook it in places. Kobarid is the place where it blossoms. Feel free to make a long stop. Indeed, this village is located in a place where the valley widens, which allows the river to display all of its beauty. This added to its Museum and monuments make an essential stopover, although the village itself has no particular features. Moreover, its restaurants are known to be among the best in Slovenia. If you follow the path which runs along the Kozjak brook, you will end up with wonder to the picturesque Veliki Kozjak falls, in a cave which concretions remind the ones in karstic caves as in Postojna. The 15 meters high fall offers an astonishing natural spectacle as it flows into the brook, in a prism or emerald and turquoise colors which pierce the darkness. The Savica River has its source in Triglav National Park, west of Bohinj Lake. A rather physical trail leads you to a lookout which offers a breathtaking view of a beautiful waterfall in the heart of a green setting. Water there is of exceptional purity and quality, so that it’s called “the source of life”. Piran is the most beautiful city in the coast. Venetian and Gothic influences mix, offering architecture out of the ordinary. Moreover, people speak as much Italian as Slovenian. It is very preserved and you can't get there by car. You must park just a few hundred meters from the city and go there on foot. Its narrow streets and colouful houses are full of charm. It has medieval buildings, which were restored in the 1980s, like the city of Ptuj. The Tartinijev Square and its neoclassical Town Hall, the sailing resort, the churches, the monastery and the baptistery are the main attractions. However, it would be a pity not to venture into the heights in order to admire the rooftops of the city, whose curious salient silhouette seems to plunge into the deep blue water of the Adriatic Sea. Portorož is typically the coastal city with great tourist attractions. Completely the opposite of Piran, hotels, casinos, restaurant and shops expanded very quickly, making it lose its authenticity and its beauty. The old Hotel Palace from the beginning of the twentieth century, and other rare style buildings have now difficulty carving out a place. Still, a pleasant summer atmosphere remains, especially along Obala, the central route, where all levels of society mix, the discrete or the eccentric (we had the surprise and the fun to meet a lady who was walking a tame raccoon!). Like Croatia, Slovenia only has pebbles or concrete beaches. However, Portorož departs from this rule by offering sandy beaches. We didn't visit the whole seafront, but in the neighborhood where we stayed, it was a wide sandbox located behind a small promenade separating it from the Adriatic Sea bordered with pebbles, in which deckchairs and parasols were placed in a quasi-military discipline. Finally, if you want to park for free in Portorož, stay on the main road and drive away from the city center in the direction of Sečovlje and the former salt marshes. After a few tens of meters, you will find a sign demarcating the meter zone and the free zone. The Postojna Caves are the inevitable site in the country par excellence. Millions of visitors gathered there through decades. Admittedly, the place suffers from excessive and sanitized tourist exploitation, but you will forget it all as soon as you walk into this extraordinary spot with a breathtaking beauty. The spectacle is astounding, shapes and colors are fabulous, result of millions years of erosion. You visit it aboard a small electric train along a 20 kilometers distance during 90 minutes. In summer as in winter, think about covering well because the temperature never exceeds 10°C. Finally, maybe you will have the privilege to behold the proteus anguinus, or «cave salamander», surprising cave-dwelling animal you can only meet in Slovenia, Croatia and Bosnia. For me, Dom, going back there was a highly emotional moment because I had already been there when I was a child, at a time when Yugoslavia was still united. Located nine kilometers away from the center of Postojna, the Predjama Castle will surprise you with its singularity. Perched on a rock face as an eagle nest and surrounded by caves and galleries, it looks an impregnable fortress. In the beginning, it was a cave-dwelling castle built in the 13th century. It was renovated in the 16th century with Romanesque, Gothic and Renaissance expansions. In addition to the visit of the castle, you can also visit the caves, but be aware that you will have to climb many ladders, lasting 30 minutes. A big medieval fair which draws crowds takes places every year in late august, early September.